Since 1st of January 2000 shall companies acting as shippers or transporter of dangerous goods appointed one or more certified Safety Adviser for the carriage of dangerous goods. The requirement is originally a EG-directive (directive 96/35/EG), adopted in the Swedish law SFS 2003:263 regarding Transport of DG and the Swedish regulation MSBFS 2015-9 regarding Safety Advisers. In short the law spells out that companies undertaking transportation, loading, unloading or other handling of dangerous goods by road, rail, sea or air shall appoint at least one Safety Adviser. The objective is to increase the safety regarding the transportation of DG. All companies sending dangerous goods are included except those sending DG in exemption related to quantities carried per transport unit. The Safety Adviser is working under the responsibility of the company management, and is either an employee or an external adviser. 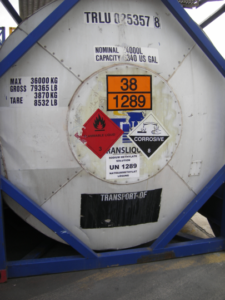 The Safety adviser´s duty is to monitoring compliance with the requirements governing the carriage of dangerous goods to secure that the transportation of DG is done under as safe conditions as possible. An Adviser shall hold a vocational training certificate issued by the National component authority or body designated, in Sweden Swedish Civil Contingencies Agency (MSB – Myndigheten för samhällsskydd och beredskap). MariTerm AB is acting as external Safety Adviser for industries and transport companies. For more information regarding Safety Adviser, please contact Nils Andersson telephone +46 42 33 31 08.